The computers are backed up, the pictures are uploaded and I've begun the processing. I put up a bunch today and I'll do the rest as time wears on. It's going to take a while, though. I took over 300 that day. So go check out the Flickr set and check back as I add more. This one is a favorite. 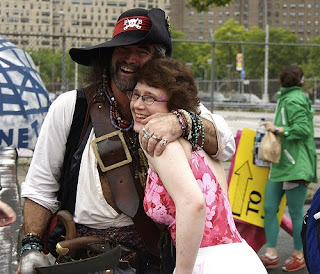 I love to see my friend happy and I fell in love with this pirate. He had a flask in his boot and I only wish we could have sat on the curb, and had a slug or two and kept laughing with him and his friends. If perchance he'd whisked me away to his pirate ship to, er, walk his plank, if you will, I also would not have objected even a little. That dude could have just stepped off a brigantine! He's welcome on my brigantine any time...if you know what I mean. And I think you do.